Jan. 22 District 9 boys’ basketball playoff recaps. KANE, Pa. – Ridgway held off a Keystone comeback attempt to reach its second straight District 9 Class 2A title game with a 42-38 win over the third-seeded Panthers at Kane High School. Second-seeded Ridgway (22-3), which led 15-10 at halftime, built the lead to 10 in the third quarter before Keystone (17-7) pushed back in the fourth quarter. The Panthers got the game within two late in the fourth quarter, but Ridgway was able to get the lead back to seven late in the game before a Troy Johnson three set the final score. But the Elkers were able to maintain the lead, and only a late shot by Keystone made the final score appear a little closer than it was. 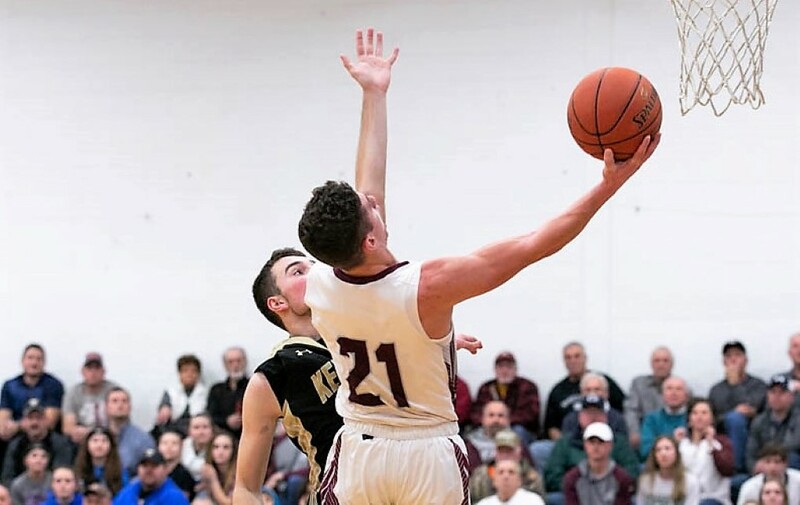 Jake Reynolds and Daunte Allegretto combined for 26 points for Ridgway with Reynolds leading the way with 14 points, including 12 of four 3-pointers. He scored nine of the Elkers 15 first-half points on three long-range shots. Allegretto chipped in with 12 points, including a pair of second-half 3-pointers. The coach’s son had five points in the fourth quarter. Johnson led Keystone with 10 points with Brooks LaVan scoring nine on three 3-pointers. Andrew Lauer and Luke Hurrelbrink each added eight tallies. Ridgway will take on Coudersport in the D9 title game for the second straight year. Last season, Coudersport won, 66-46. It will be the second meeting of the year between the team, as the Elkers handed the Falcons their only loss of the season, 57-56, Jan. 4, in Coudersport. A date, time and place for that game will be announced soon. Keystone’s season isn’t over yet, as District 9 takes three teams to the PIAA Playoffs in Class 2A. The Panthers will play KSAC South rival Karns City in the consolation game at a date, time and place to be announced. The Gremlins and Panthers split a pair of games this season. ST. MARYS, Pa. – Coudersport rode a hot start to its fourth straight District 9 championship game appearance thanks to an 83-67 win over Karns City in the Class 2A semifinals at St. Marys High School. The top-seeded Falcons (23-1), who are the two-time defending Class 2A champions, hit six first-quarter 3-pointers on their way to a 30-10 lead after eight minutes. Fourth-seeded Karns City (16-8), who had won two consecutive D9 titles in Class 3A before moving down to 2A this season, fought back and closed the deficit to 11, 46-35, at halftime and got as close as nine a couple of times in the third quarter. Owen Chambers led all scorers with 29 points giving him 2,188 in his career, 69 shy of the D9 career record of 2,257 set by Johnsonburg’s Calvin Grumley in 2007. But it was a strange night for Chambers, who came into the game averaging just over 31 points per game. He exploded for 13 points in the first quarter and 11 in the third but was held to just three second-quarter tallies and two points, one a pair of free throws, in the fourth. But with Chambers being held down in the second quarter, sophomore point guard Hayden Keck helped the Falcons maintain the lead despite the Karns City charge. Keck scored 10 of his 24 points in the second quarter. Keck talked about the win. Dillon Keglovits (12 points) and Kolby VanWhy (10) also reached double digits for Coudersport. Austin Fahlor paced Karns City with 23 points, Chase Beighley added 18, Ethan McElroy 15 and Nathan Waltman eight. Coudersport will play Ridgway in the District 9 title game for the second consecutive season. They beat the Elkers, 66-46, for the title last year. Ridgway handed Coudersport its only loss of the year, 57-56, Jan. 4, in Coudersport. A date, time and place for that game will be announced soon. It is the fourth straight D9 title-game appearance for the Falcons, who lost in Class 1A in 2016 to Elk County Catholic. Karns City’s season isn’t over yet, as District 9 takes three teams to the PIAA Playoffs in Class 2A. The Gremlins will play KSAC South rival Keystone in the consolation game at a date, time and place to be announced. The Gremlins and Panthers split a pair of games this season. BRADFORD, Pa. – Tyler Gigliotti exploded for 26 points to lead Bradford to a 58-35 win over visiting St. Marys in the District 9 Class 4A semifinals. Gigliotti was held to just two first-quarter points, as St. Marys took an 8-4 lead after a quarter of play. But he hit a pair of 3-pointers and scored eight points in the second quarter to help lift the second-seeded Owls (11-12) to a 19-18 halftime lead. Bradford then outscored the third-seeded Dutch (7-15) 17-9 in the third quarter to take control of the game. Gaven Babcock and Steve Knowlton each added eight points in the victory, while Donny Pattison grabbed 11 rebounds to go with four points and Babcock added seven boards. Cahill Parrish and Mitchell Reiter each scored 10 points to pace St. Marys. Bradford will play top-seeded Clearfield in the title game at 7:30 p.m. Wednesday, Feb. 27, at DuBois High School.